Bavik Super Pils, from Global Beer, is a true Belgian Pilsner with a smooth bitter taste. It’s 100% malt with absolutely no dilution, keeping true to its pilsner form. All of the delicious ingredients are added during the brewing process. It’s very light with a fine white head and its aftertaste is soft and round. This pilsner is made with no heat treatment, bringing you an unpasteurized Belgian pilsner with a super unique flavor that all beer lovers will enjoy. Learn more about this special product here. Good news! Mollie Stone’s Markets and Bavik are teaming up for this special giveaway! It’s so easy to enter. 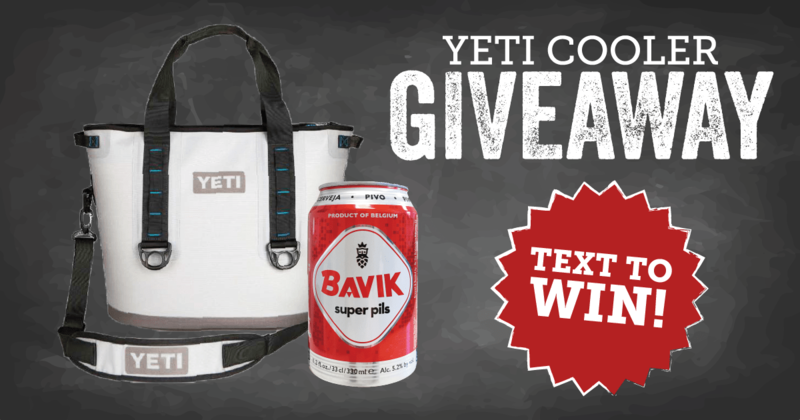 To enter, text BAVIK to 31996 for a chance to win a FREE YETI COOLER! Raffle runs May 10, 2017-Jun. 6, 2017. No purchase necessary. One entry per customer. Must be 21 years old or older to enter. Data rates and other restrictions may apply. Don’t forget to pick up Bavik Super Pils, available in the beer section at Mollie Stone’s Markets.